Make perfect trattoria-style Italian panini sandwiches. Measures, 8.5"/21.5cm by 8.25"/21cm. Made of Enamel coated Cast Iron. 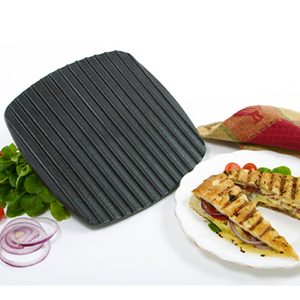 Cut cooking time in half by grilling both sides at once using our Nonstick Grilling Pan (652). Ideal for steaks, burgers and chicken. Heat quickly and grills evenly. Hand wash, rinse and dry - never soak cast iron. Enamel cast iron nonstick.